The Elliott Chaparral Reserve, formerly part of the Camp Elliott Military Reservation, is located adjacent to the Marine Corps Air Station Miramar near Scripps Ranch, California. It includes a mixture of both coastal and desert habitats with a wide variety of coastal chaparral and coastal sage scrub. Location: San Diego County, 16 km (10 mi) northeast of San Diego campus; adjacent to Marine Corps Air Station Miramar. Facilities: Field station includes storage container (8 ft x 20 ft.); trailer for staging, research, and short-stay accommodation for up to four; currently (September 2011) being upgraded with internet connection, and wireless access. Weather station with real-time data via web. Resources: Reserve-based publications since 1995; herbarium (on campus); species lists for birds, herptiles, small mammals, vascular plants. Personnel: Academic coordinator on campus; roaming steward; no personnel on site. Elliott Chaparral Reserve occupies the slopes of an inland mesa and its adjacent ridge ten miles east of the University of California, San Diego. Bounded north and south by broad, flat-bottomed valleys and associated arroyos, the reserve is supports a remarkably diverse mixture of natural coastal and desert habitats. Together with its neighbors, the University of California Elliott Field Station and a military base, the reserve provides broad expanse of largely undeveloped, contiguous land that is becoming rare with rapid suburban growth in the San Diego region. The lands that make up Elliott Chaparral Reserve once belonged to Mission San Diego de Alcalá. When mission lands were confiscated by the Mexican government in 1846, Rancho Ex-Mission San Diego was granted to Santiago Arguello, commandante of the San Diego Presidio. The property stretched 20 miles north to the San Dieguito Valley, 50 miles east to Santa Ysabel, and south to El Rosario in Baja California. Like the rest of Alta California, the rancho became part of the United States after the Mexican-American War of 1846-1848. In the 1890s, newspaper publisher Edward Willis Scripps and his half-sister, Ellen Browning Scripps, bought a portion of the rancho and named it the Scripps Miramar Ranch. The Scripps siblings went on to become the founding donors of Scripps Institution of Oceanography. In the buildup to World War II, the U.S. Marine Corps commandeered 32,000 acres of land in the vicinity of Scripps Miramar Ranch. These were designated Camp Elliott in honor of Major General George F. Elliott, tenth commandant of the Marine Corps. In 1960, Camp Elliott was decommissioned and divided between Naval Air Station Miramar and an Atlas Missile test facility. The University of California acquired approximately 500 acres of former Camp Elliott land from the military in 1965. UCLA professor and NRS cofounder Mildred E. Mathias urged the Kearny Mesa site be incorporated into the NRS for its unique biological resources. Elliott Chaparral Reserve was created from a portion of this property in 1969. The adjacent military lands, now called Marine Corps Air Station Miramar, are still used for military training and operational exercises, but also include rare vernal pools on clay hardpan soils. These are available for research use through a license agreement with the NRS. The rolling topography of the Elliott Chaparral Reserve is covered with an unusual mixture of south coastal chaparral. Stands of nearly pure chamise (Adenostema fasciculatum) are intermixed with elements of coastal sage scrub and narrow riparian corridors. Chaparral stands at the reserve are more stunted and open than in most other southern California locations because the soils are thin, drain rapidly, and have been leached of nutrients. Such demanding conditions have helped retain the integrity of the site’s plant communities; some 83 percent of the vascular plant species recorded at the reserve are native. Several plant species with restricted distributions, such as inland scrub oak (Quercus berberidifolia), Whipple’s yucca (Hesperoyucca whipplei), ashy spikemoss (Selaginella bigelovii), and chaparral lilac (Ceonothus spp. ), plus many fire-following native annuals also can be found here. Approximately one-third of the reserve supports stands of the non-native Tasmanian blue-gum (Eucalyptus globulus). Located primarily along the ridgeline, these trees were planted in the late nineteenth and early twentieth centuries for railroad ties and other commercial uses. Large mammals such as mountain lion (Puma concolor), bobcat (Lynx rufus), and deer (Odocoileus hemionus) remain part of the Elliott Chaparral ecosystem thanks to the open military lands to the south. Native birds found at the reserve include the greater roadrunner (Geococcyx californianus) and rufous-crowned sparrow (Aimophila ruficeps), which are sensitive to habitat fragmentation. The reserve appears to have a particularly rich native ant fauna, including five species of harvester ants, and one ant genus yet to be described. The dense population and aridity of San Diego County makes the reserve especially vulnerable to fire, as became all too evident in 2003. That October, during the driest part of the year, a man lost in the nearby Cleveland National Forest set a fire to signal for help. His blaze ignited a massive firestorm. Fueled by Santa Ana winds, the Cedar Fire burned for ten days before it was contained. The largest wildfire recorded in California, the Cedar Fire consumed 280,278 acres, destroyed 2,820 buildings, and killed fifteen people. Burned areas included ninety-five percent of the Elliott Chaparral Reserve. Within that the charred and smoking landscape, scientists saw a chance to learn how the ecosystem responds to fire. Among their discoveries was the fact that different plant species burn with varying intensity. The blaze killed few blue-gum eucalyptus; instead, their trunk sprouted shoots with extra vigor. Native woody species re-established themselves rapidly, spreading from 45 percent surface cover in the first year to 75 percent in the fifth year. Nearly all of the coastal sage scrub oak (Quercus dumosa) and mission manzanita (Xylococcus bicolor), whose seeds tend to be killed by fire, simply resprouted. Plant species that produce abundant dormant seeds, such as Ceanothus, rock rose (Helianthemum scoparium), and deerweed (Lotus scoparius), reappeared in large numbers. Chamise shrubs not only re-sprouted from root crowns, but also produced abundant seedlings. And wildflowers bloomed with spectacular intensity in the first few years afterward. Native annuals such as California poppies (Eschscholzia californica) and royal goldfields (Lasthenia coronaria), but also perennial plants with underground storage organs such as mariposa lilies (Calochortus spp.) and goldenstars (Bloomeria crocea) flourished in the ashes. Today, Elliott Chaparral appears much as it did before the burn, a testament to the resilience of nature. The Elliott Chaparral Reserve, formerly part of the Camp Elliott Military Reservation, is located adjacent to the Marine Corps Air Station Miramar near Scripps Ranch, California. It includes a mixture of both coastal and desert habitats with a wide variety of coastal chaparral and coastal sage scrub. To visit the reserve, an application and reservation(s) must be submitted to the UCSD Natural Reserve System at least a month in advance. The Elliott Reserve is located across several ridges and valleys. Vehicle access is served by a paved (but somewhat degraded) road, unpaved roads, and dirt trails. If bringing a vehicle, you will need to obtain a dashboard permit (to identify yourself as a legitimate user, in case the military personnel in the adjacent area – which is not defined by a fence – become inquisitive.) When visiting the Elliott reserve, please keep in mind that these areas are Formerly Used Defense Sites (FUDS) [PDF] and may contain debris left from military activity. If any debris is found, please refer to the Environment, Health and Safety site on how to report objects, and notify the NRS steward. There is a basic trailer for use as a field station (see map), which currently does not have utilities installed, but can serve as a base of operations. Internet access is available via wireless LAN. Ask the manager or the steward for access information. 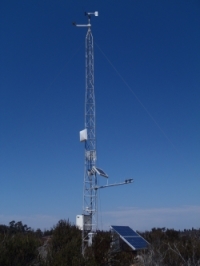 There is a weather station located at the western edge of the reserve for which data are available at http://www.wrcc.dri.edu/weather/ucel.html. Please let us know if you cannot access the website or if there appears to be a problem with the data. If you wish to make a one-time visit to the reserve to determine its suitability for your proposed use, please contact the manager to arrange short term access. Access to the Elliott Reserve is restricted by locked gates, including one controlled by a finger-print scanning device. After your application is approved, it will be forwarded for review to the Animal Care Program, who control the finger-scan access. Access is controlled by the UCSD Animal Care Facility. Therefore, if you are planning to conduct research on animals that will be captured, please allow time to process an IACUC review. These data are archived by the Western Regional Climate Center, whose researchers also installed the station, which is maintained by the Natural Reserve System. Please let us know if you cannot access the website or if there appears to be a problem with the data. Climate data are also available for a nearby point to the SW of the Elliott Chaparral Reserve, in Camp Elliot [sic]. The behavior of an ant colony is self-organized and emerges from the actions of the workers that comprise it. The interactions among workers regulate colony activity. Colonies of the harvester ant Messor andrei change their behavior in response to weather and nest site (Pinter-Wollman et al 2012). This suggests that nest architecture affects the behavior of the colony through influencing worker interactions. To test the hypothesis that nest architecture determines colony behavior i will examine the behavior of Messor andrei ant colonies on Elliot reserve. Messor andrei ants often move among nest sites. I will examine colony behavior over time before and after it relocates to a new nest site to determine whether colony behavior changed immediately before or after the move. Furthermore, after a colony vacates a nest site i will use plaster to create a cast of the top part of the nest. Tunnel width and depth may affect how ants interact with one another. I will measure the number, depth, and width of nest tunnels to determine whether colony behavior is related to these architectural features. Relevant work: Pinter-Wollman N. Gordon D.M. & Holmes S. 2012. Nest site and weather affect the “personality” of harvester ant colonies. Behavioural Ecology. doi: 10.1093/beheco/ars066. As anthropogenic activities continue to alter environmental conditions, ecologists are challenged to predict how natural systems will respond. Species vary in their tolerances to environmental constraints such as drought, as well as their capacity to compete for limiting nutrients with other species (Tilman 1982). Functional traits integrate these ecological tolerances and strategies for obtaining resources (Lavoral et al. 1999). This provides a framework for predicting how species composition is likely to respond to shifting environmental conditions and resource supplies (Suding et al 2008). In areas where the range of potentially successful ecological strategies are restricted by environmental conditions, species are likely to converge on a common set of functional traits associated with environmental tolerance (e.g. habitat filtering, Weiher & Keddy). In areas where resources are abundant, competition among species may become a more important predictor of community composition than environmental tolerance, hence permitting a broader array of strategies to co-exist. Further, the concept of limiting similarity predicts that species will be more likely to co-exist if they use different resources or use limiting resources at different times, such that the community may diverge in functional traits. In Southern California, precipitation levels are expected to decline overall and also become more variable in the coming decades. The proposed research seeks to better understand the role of precipitation as a habitat filter, influencing patterns of trait divergence and convergence in a chaparral community. I hypothesize that with lower levels of precipitation, highly adapted native chaparral species, will display a convergence in the following traits: high water use efficiency, low specific leaf area, similar flowering time and length of flowering and will outperform divergent alien species. I further expect that as levels of rainfall increase, native species will be unable to take advantage of the surplus resource (rainfall). As a result, divergent species with novel traits, such as invasive annual grasses, will be able to outcompete native species and establish within the community. We collect rainfall from slanted acrylic roof tops over plots of intact chaparral vegetation, and redistribute the rainfall to plots from low to high quantities. Once per year small biomass harvests will remove above-ground plant material in each plot (0.25 m2). Each year shallow soil cores will be collected in each plot to evaluate soil nutrient status. No introductions will be made, nor will any animals be collected. We have instrumentation in the plots, including soil moisture sensors. Observed pollinator declines worldwide have been shown to correlate with a decline in the population of associated native plants. The immediate consequences of pollinator species loss on the reproduction of associated flowering plants, however, have thus far received little examination. Preliminary native bee surveys in large natural reserves and small ?Open Space? fragments have demonstrated that large reserves consistently harbor more native bee species than do small fragments. Thus, I propose a temporary native plant introduction experiment in large reserves and small fragments to examine how differences in native bee species richness affects floral visitation and subsequent fruit and seed set of focal native plant species. Data collected in this project will also contribute to ongoing projects to elucidate patterns of native bee response to habitat fragmentation and to inventory bee species richness in San Diego County. I will temporarily bring in native plants, in their pots, to examine pollinator visitation. Upon senescence of the flowers, all plants will be transported back to the laboratory (thus no seeds or other plant parts will be left in the reserves). Go north on I-15 and follow directions below. From Interstate 15, exit east on Pomerado Road. Take the second right, where a gate and UC San Diego Elliott Field Station sign are visible. The first locked gate at the reserve entrance is a Palm Scan Gate. With the manager's approval (via online application) you must have your hand scanned for access on the UCSD campus prior to arriving. At the middle gate, the NRS combination lock and chain should be carefully replaced in the sequence where found. Do NOT tighten the chain more than necessary to lock it. To leave the main paved road, a high clearance, four-wheel drive is necessary.